This article is about the section of U.S. Route 220 in North Carolina. For the entire route, see U.S. Route 220. In the U.S. state of North Carolina, U.S. Route 220 (US 220) is a north–south highway that connects the cities of Rockingham, Asheboro and Greensboro, in the central Piedmont. US 220 in North Carolina feature a few dedicated or memorialized stretches of freeway. Governor John Motley Morehead Expressway – official North Carolina name of US 220 from the south Greensboro city limits to Interstate 40 (approved: April 12, 1996). J. Elsie Webb Thoroughfare – official North Carolina name of US 220 from US 1, in Rockingham, to Ellerbe (approved: February 3, 1972). Martha McGee Bell Bridges – official North Carolina name of US 220's twin bridges over the Deep River, near Randleman (approved: August 11, 1978). Rush C. Collins Bridge – official North Carolina name of US 220's bridge over the Dan River (approved: October 2, 1969). Thomas A. Burton Highway – official North Carolina name of US 220 from NC 68 to the Virginia state line (approved: March 4, 1994). Established in 1935 when US 220 was extended south from Virginia; it replaced: US 311/NC 77 from the state line to Madison, US 411/NC 704 from Madison to Greensboro, US 411/NC 70 from Greensboro to Candor, US 411/NC 170 from Candor to Norman, and US 15/NC 75 from Norman to Rockingham. By 1939, US 220 was realigned west of Seagrove, leaving Old US Highway 220 and an extension of NC 705. By 1963, US 220 bypassed Madison and Mayodan, the old route through the towns became US 220 Business. Between 1964-1966, Stoneville was bypassed to its west. Between 1967-1968, US 220 we realigned west, onto new freeway, of Asheboro, leaving US 220 Business. In 1970, US 220 was rerouted in Greensboro, from Randleman Road it overlapped with Interstate 85 then onto O. Henry Boulevard (in concurrency with US 29) going north till Wendover Avenue, then west to Battleground Avenue; the original alignment through downtown Greensboro became unnumbered. In the 1970s, US 220 was continuously moved onto new freeway, bypassing Randleman and Level Cross. Also, at some point during the decade, US 220 was extended south to its current terminus with US 1, leaving behind Ellerbe Road in Rockingham. In 1980, US 220 was moved onto new freeway between Steeds and Emery, its old alignment became US 220 Alternate. Between 1981-1983, US 220 moved onto new freeway from Level Cross to Interstate 85, leaving an unnumbered Randleman Road. In 1995, US 220 was moved onto new freeway between Interstate 85 to Interstate 40. In May, 1997, US 220 was moved onto new freeway between Ether and NC 134; it not only extended US 220 Alternate over the old alignment, but also became the first section of both Interstate 73 and Interstate 74. On January 7, 2008, US 220 was moved onto new freeway between Emery to south of Ellerbe, leaving its old alignment another extension of US 220 Alternate. U.S. Route 411 (US 411) was established in 1932 as the second national US 411, traversed entirely in North Carolina. Starting on Washington Street, in Rockingham, it traveled with US 74 to Ellerbe Road then north through Ellerbe, Norman, Candor, Biscoe, Star, and Seagrove, mostly along what is today US 220 Bus and US 220 Alt. In Asheboro, it went along Fayetteville Street, then continued north on Randleman Road and on Old Randleman Road into Greensboro. Through Greensboro, it was routed along Randleman Road, O'Connor Street, Elm Street, and Battleground Road; in 1934, it was rerouted north of Elm Street to Wendover Avenue, Winstead Place, Northwood Street, and Battleground Road. Going northwest, it continued to Madison, where it ended at US 311. In 1935, the entire route was renumbered as part of US 220. North Carolina Highway 897 (NC 897) was an original state highway that traversed from NC 60/NC 65, in Winston-Salem, to SR 33 at the Virginia state line. Going north on Liberty Street, from 4th Street, in Winston-Salem, it went at a northeasterly route along Old Walkertown Road and Pine Hall Road to Pine Hall. Continuing northeasterly, it connects Madison, Mayodan, Stoneville and Price, North Carolina before reaching the Virginia state line. In 1925, it was renumbered as part of NC 77. Today, all of the Forsyth and Stokes section of NC 897 have been downgraded to secondary roads; while the Pine Hall to Madison section is part of US 311 and the Madison to Stoneville is part of US 220 Business. The Western Rockingham Bypass, from the US 74/US 74 Bus. interchange to US 220 Alt near Ellerbe. Currently all right-of-way purchases have been completed along the proposed route, with construction beginning in 2012 on upgrading US 220 north of Rockingham. The remaining sections of the new bypass is currently scheduled to begin construction in late 2017; however, it is subject to reprioritization. Widen US 220 to multi-lanes, from Horse Pen Creek Road, in Greensboro, to Winfree Road, in Summerfield. Funded, with construction expected to be completed in December 2016. ^ a b Google (January 5, 2014). "US 220 in North Carolina" (Map). Google Maps. Google. Retrieved January 5, 2014. ^ Google (July 14, 2013). "U.S. Route 411" (Map). Google Maps. Google. Retrieved July 14, 2013. ^ Google (May 19, 2014). "North Carolina Highway 897" (Map). Google Maps. Google. Retrieved May 19, 2014. 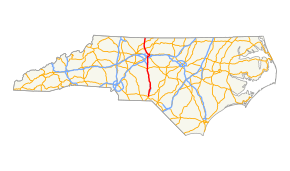 ^ State Highway System of North Carolina (PDF) (Map). Cartography by NCDOT. North Carolina Department of Transportation. 1930. Retrieved May 19, 2014. ^ a b Staff. "Project #R-3421". Project Details. North Carolina Department of Transportation. Archived from the original on 2011-10-29. Retrieved August 26, 2012. ^ Staff. "Project #R-2309". Project Details. North Carolina Department of Transportation. Archived from the original on 2011-10-29. Retrieved August 26, 2012.